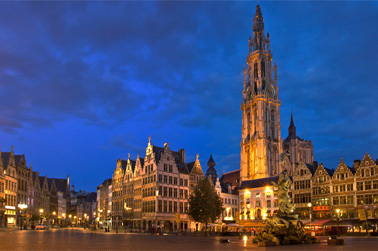 Antwerp is the Belgian city, located in northern Europe. It was formed nearly a half thousand years ago (around the 7th century AD), and located on the banks of the Scheldt River. The city developed due to its fortunate location: it is situated at the Europe’s transport routes crossing. It was one of the richest European commercial and cultural centers for a long time. Since the 10th century, the port of Antwerp was one of the largest sea ports in the world. It is currently the second largest port in Europe and one of the most important links of the world trade. The port handles about 180 million tones of international floating cargos in a year. A striking feature of Antwerp is that it is the capital of the jewels of the country and all over Europe. More than 70% of the global turnover of precious stones is concentrated in the famous 'Golden Quarter' of Antwerp. Local business revolves around the diamonds, the gold and other precious stones and metals. There is even the Diamond museum, where you can watch the cutter’s work. The city's name “hand werpen” is translated from Dutch as “throw an arm”. This name has more to it than meets the eye. The legend says, that there was the giant, called Druon Antigonus, who robbed river boats and forced all travelers to pay a high duty. If somebody refused, he cut off his hand and threw it into the water. But once he met the Roman soldier Silvius Brabo, who cut off the giant's hand and threw it into the river. This event determined the name of the city. The city's population is about 500 thousand people. Antwerp is one of the main cultural centers of Europe. It is a quiet, stylish city, with a lot of monuments of the Middle Ages and the Renaissance. The city is famous for its majestic Cathedral of Our Lady, the highest in Belgium (123 meters). There is a fountain with the statue of Brabo, the afore-mentioned soldier, holding the severed hand of a giant, in the ancient Grote Markt (translates as ‘a big market’) in the center of Antwerp. Tourists can visit the Royale Museum of Fine Arts with the masterpieces of Flanders and mazes of medieval streets in the city center. Another place of interest is the Rubenshuis, the house of Rubens, filled with the paintings and objects of everyday life of the famous painter, the creator of brilliant artistic style of Baroque. In Antwerp you can also visit the oldest zoo of Belgium, founded in 1843, which currently contains more than 5000 animals. Entrance to the zoo for adults costs about 12 euros. 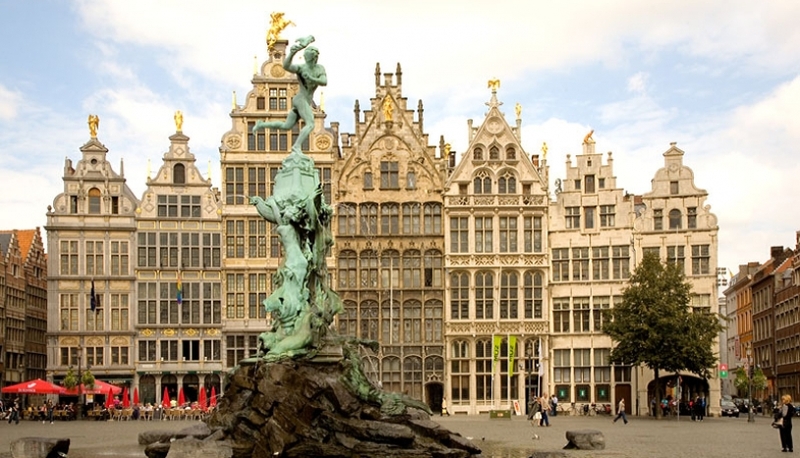 Antwerp has the largest amount of restaurants, bars, pubs, nightclubs in the whole Belgium. The citizens of Amsterdam go to Antwerp, when they want to have a good time in the city of the Golden Age.